QUINCY, IL - April 2005 - United Systems, Inc., an industry leader in telecommunications, announced today that the company has developed a new department to provide current and prospective customers with an even higher level of service and satisfaction. The Customer Advocate Department will help businesses of all sizes take advantage of leading communications technology to increase profitability, enhance productivity, and give them a competitive advantage in their marketplace. "We conducted a thorough needs analysis of our vast customer base and found that companies were interested in learning more about the latest developments in communications, find creative ways to reduce costs, and obtain a better understanding of how to efficiently utilize technology to grow their organizations. However, these same companies didn't have the means, resources, or expertise to stay at the forefront of advancements in technology," said Mike Melton, President of United Systems. "This attitude is very different than recent years when executives were only concerned with plugging in the equipment and letting them run on their own. Technology is changing so rapidly that in order to remain competitive one has to adapt and maximize it to the fullest extent or they may not be around tomorrow." The mission of United Systems' Customer Advocate Department is to engage the telecommunication company's customers and proactively make them aware of technologies that they haven't currently adopted which could greatly benefit their business. Some examples of these technologies include Voice over Internet (VoIP), call accounting, web and audio conferencing, GPS tracking systems for company vehicles, voice recognition, and digital surveillance systems. Through its strategic partnerships with leading industry providers like BandTel, Ultimate Software, IPx Connect, Network Car and MG Security Systems, United Systems can easily coordinate and implement numerous solutions, which in most cases will have an immediate impact on the performance of any company. Each Customer Advocate will communicate critical information via online technology seminars, ongoing email newsletters, and one-to-one communication. "We strongly believe that our Customer Advocate Department will keep our customers educated on an ever changing technological environment and enhance the performance of their business," added Mr. Melton. "Our objective is to assist our customers in bridging the gap to technology and design a game plan to successfully implement it within their companies. Our success depends on those businesses we serve and I feel it is United Systems' duty, as their strategic telecommunications partner, to provide an avenue that will help them experience significant success." 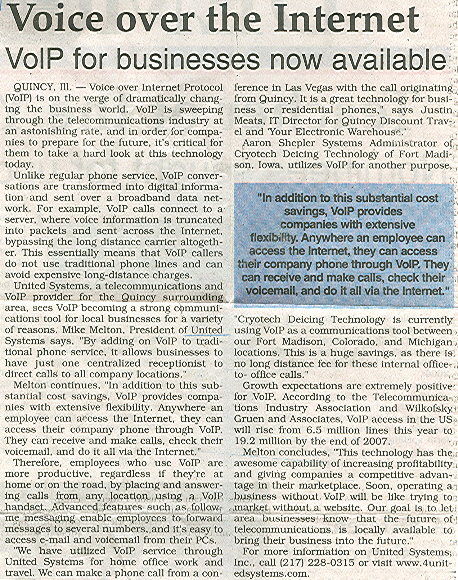 VoIP the Future of Biz Communication? Over the coming years, businesses will increasingly turn to IP telephony for their communication needs. In-Stat reports that over 30% of businesses of all sizes in the US are interested in Internet protocol (IP) telephony and plan to adopt such solutions this year. Currently, 10% of the installed base of voice lines in the enterprise market is using IP telephony. In-Stat explains that the key to usage growth is if vendors address the needs of every organization no matter what size. Kneko Burney, Chief Market Strategist for In-Stat, says, "...the successful vendors will be those that offer customers, large and small, an array of products that can meet a variety of needs, from small office to campus installations, from specific applications to PBX-replacement." In-Stat expects an important key to vendor success will be the "small IP network" which is tailor made for single sites with 20 users or less. As the average business has 100 small sites, there is plenty of room for vendor growth and opportunity. Indeed though Heavy Reading estimates over 64% of large enterprises will purchase VoIP hardware this year, a notable 48.4% of businesses with less than 1,000 employees will do the same over 2005. And while the latest survey of CIOs from CIO Magazine and Deutsche Bank reports that just under 50% of CIOs have no plans to install VoIP over the next 12 months (as of October 2004), it finds that roughly 26% will implement the communication technology within the year while under 26% already have VoIP set up. This issue's 2004 Product of the Year Awards attracted submissions from more than 250 vendors. This plethora of entries maps out a convergence landscape much-changed from a year ago, and shows a path to the future that's suddenly clearer in some important respects. If hype and overprojection were hallmarks of the Internet bubble; under-projection, and careful treading, have so far governed the recession. For the past few years, the industry has ordered its PowerPoint presentations towards ROI and legacy-friendliness. The idea that technology might change the rules entirely was taken off the (public) table; replaced by a born-again faith that - in telecom at least - change is hard and takes a long, long time. Meanwhile, technology has changed the rules entirely. Despite the conservative tone of their PPTs, vendors have used the recession to good effect: consolidating new technology initiatives, and turning tentative explorations of ‘optional IP' into core architecture and authoritative product offerings. New market entrants, meanwhile, have had some quiet time to watch the marketplace and lock their offerings to the strongest trends. Today, lingering economic resistance seems to be encouraging brave moves, rather than retarding them. Our Product of the Year winner's circle is replete with companies who get it - who have moved ahead fast during this era of market quiescence, and are now set to outpace the recovery. Intermingled amongst our selections, we've invited various industry luminaries to share their "Visions of Convergence" with you in sidebars throughout this article. You'll know they're visionary, of course, by the prerequisite ocular icon. Enjoy. And congrats to this year's winners. Toshiba America Information Systems (www.toshiba.com) has always been smart about balancing aggressive adoption of new technology and solid core product engineering. Two years ago, they became the first major vendor to OEM a software-based PBX (Artisoft's TeleVantage, marketed as the Toshiba Strata CS Communications Server) subsequently enhancing the product several ways and making it compatible with Toshiba's award-winning digital desksets. They've also persistently upgraded their now-classic DK line of hybrid PBXs, introducing a new line of integrated, RISC-powered hybrid PBXs (the CTX 100 and 670). While the exceptionally full-featured CTX series are based around a conventional PCM backplane architecture, they can be optioned to access IP trunks and (using MCK PBX eXtender solutions, which support Toshiba desksets directly at the far end of an IP voice/signaling link) remote IP stations with full feature support. The CTX machines sport an extremely robust Q.SIG multi-premise internetworking facility, as well as Windows-based, IP-linked remote management. 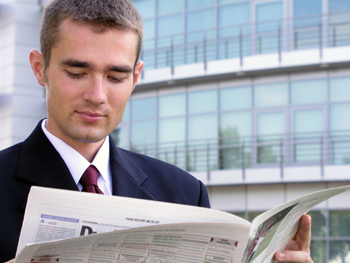 Sophisticated ACD software, UC, and other applications are options. The networking of multiple systems has always caught our eye. When centralized, networked systems function as one integrated network that can be configured to let users call each other across nodes with simple directory numbers. This eliminates the need for awkward access codes and network maps. Calls that don't get through can be forwarded to any node in the network, including a centralized voicemail system or attendant. That's right. One attendant can also serve this entire network. Station users only need to dial "0" to reach the centralized attendant, regardless of the node in which they reside. The attendant can reach any station in the network using its Network Directory Number. Trunks attached to any network node can be programmed to terminate to the centralized attendant. Unanswered calls are also forwarded to centralized voicemail. The source and calling conditions are identified and the appropriate voice mailbox greeting is played. The voicemail system can control message-waiting indications throughout the network as messages are left and retrieved. A single network can even support multiple centralized voicemail systems, with each station being programmed for the appropriate system. Copyright© 2003 by CMP Media LLC, 600 Community Drive, Manhasset, NY 11030.